The one-year contract will expire in September 2015 and includes no wage increase. “We would have liked a raise but we are glad to have finally reached an agreement after more than a year of hard work by Guild members,” Unit Chair Phillip Molnar said. 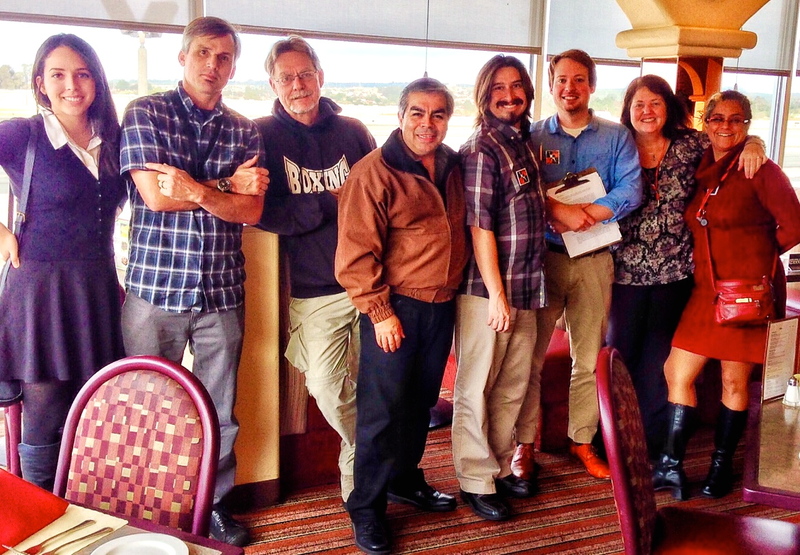 Monterey Herald Guild members approved a new contract on Wednesday. Pictured from left: Ana Ceballos, David Royal, Dennis Taylor, James Herrera, Tommy Wright, Phil Molnar (Unit Chair), Julie Reynolds, and Claudia Melendez. The campaign to win a contract included delivering a petition signed by 38 employees to Publisher Gary Omernick asking for a pay increase and cap on health care benefits; wearing Guild pins and T-shirts on planned days; launching an online petition; and participating in a national campaign coordinated by The Newspaper Guild to find new owners for Digital First Media. Members’ base pay has been frozen for more than four years. During that time, employees were asked to take two week-long, unpaid furloughs — a loss of roughly 4 percent of take-home pay. In the three years before that, base pay increased by 1 percent annually, but was offset by two week-long unpaid furloughs and an increase in the employee share of medical premiums.